Thomas Martin Veryzer (February 11, 1953 – July 8, 2014) was an American Major League Baseball shortstop. Upon graduation from Islip High School in Islip, New York, Veryzer was drafted by the Detroit Tigers in the first round (eleventh pick overall) of the 1971 Major League Baseball Draft. His older brother, James, had been drafted by the Kansas City Athletics in the 49th round of the 1967 Major League Baseball Draft, but had also moved to the Tigers' organization by 1971 as well. Veryzer batted just .225 with four home runs and twenty RBIs in his first professional season with the Bristol Tigers, but his slick glove earned him Appalachian League MVP honors. 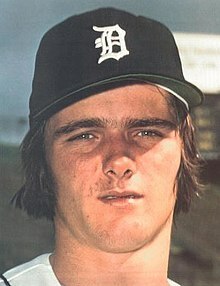 After two and a half seasons in the minors, he was called up to the majors in 1973 at just twenty years old. Although he remained with the club through the rest of the season, he saw very little playing time with All-Star Ed Brinkman at short. However, in his limited playing time, he batted .300 (6 for 20), and had an RBI single off the Minnesota Twins' Dave Goltz in his first major league at-bat. He started the 1974 season with the triple A Evansville Triplets, but was again brought up in August when the Tigers dealt Jim Northrup to the Montreal Expos. He had a career game against the Milwaukee Brewers on September 20. He hit a two run home run in the second inning to give the Tigers a 2-1 lead. After the Tigers surrendered the lead, he hit an RBI single in the seventh to tie the game back up. In all, he went three-for-four with a home run, two walks and four runs batted in. The Tigers traded Brinkman at the 1974 Winter Meetings, opening the door for Veryzer at short. On June 8, 1975, he doubled with two out in the ninth inning to break-up a no-hitter by Ken Holtzman. For the season, he batted .252 with five home runs and 48 RBIs (both career highs) while also hitting thirteen doubles to be named the shortstop on the Topps Rookie All-Star team. However, his 24 errors at short were fourth highest in the league. Injuries limited Veryzer to 97 games in 1976. He returned healthy in 1977, but a horrible month of May (.093 batting average, 5 RBIs & 2 errors on the field) caused him to lose playing time to Mark Wagner and Chuck Scrivener. The three combined to bat .174 with three home runs and 33 RBIs while committing 26 errors. After the season, Veryzer was dealt to the Cleveland Indians for outfielder Charlie Spikes, opening the door for Alan Trammell to assume the starting shortstop job in Detroit for the next sixteen years. Larvell Blanks won the starting shortstop job out of Spring training 1978, but inconsistent fielding led to his being replaced by Veryzer at the start of May. With Duane Kuiper at second and Buddy Bell at third, the Indians boasted one of the better fielding infields in the American League, however, light hitting relegated them to a sixth-place finish in the American League East. For his part, Veryzer batted .271 with one home run and 32 RBIs. His most memorable moment of the season may have come on September 13 when he drove in the winning run of the Indians' 2-1 victory over the Boston Red Sox with a successful suicide squeeze bunt, knocking the Red Sox out of first place. His offensive numbers slumped to .220 with no home runs and 34 RBIs, but he had his finest season with the glove in 1979. Veryzer figured in ninety double plays while logging a career high .974 fielding percentage in a career high 702 chances. Tendinitis caused Veryzer to miss two weeks at the start of June, and a month of play in the second half of the 1980 season. He was at his best when healthy, however, batting .271 and putting up a .971 fielding percentage. Likewise, injuries caused Veryzer to miss two weeks toward the end of the 1981 season. On May 15, 1981, Veryzer made a brilliant play on an Alfredo Griffin ground ball up the middle to record the first out of the day's match-up with the Toronto Blue Jays. From there, Indians pitcher Len Barker retired the next 26 batters he faced for the first perfect game in the majors since 1968. During the off-season, he was traded to the New York Mets for pitcher Ray Searage. Veryzer competed with Ron Gardenhire and Bob Bailor for the Mets' starting shortstop job in Spring training 1982. Gardenhire won the starting job, but Veryzer still saw a decent amount of playing time backing up Gardenhire and Wally Backman at second until a broken leg ended his season on June 1. During Spring training 1983, he was dealt to the Chicago Cubs for two minor league pitchers. With Larry Bowa at short and Ryne Sandberg beginning his Hall of Fame career at second, Veryzer saw very little playing time with the Cubs. In two seasons with the Cubs, he made just 175 plate appearances, batting .198. However, playing with the Cubs allowed him to reach the post-season for the only time in his career in his final season. He appeared in three of the five games of the 1984 National League Championship Series as a late inning defensive replacement, logging his only career post-season at-bat in game four. He popped out to Garry Templeton in foul territory. With former 1982 Major League Baseball Draft number one overall draft pick Shawon Dunston ready to make the jump to the majors, Bowa was reduced to a reserve role in 1985, and Veryzer was cut during Spring training. He ended his career having played in 996 Major League games, with a career batting average of .241 with 687 hits, 231 RBIs and 14 home runs. Veryzer died on July 8, 2014 after suffering a stroke the previous week. He was survived by his wife Vivian, and children Tom Jr., Billy and Jennie. ^ "#276 Tom Veryzer". 1980 Topps Baseball Card Project. May 12, 2010. ^ "Tigers Win". Toledo Blade. August 10, 1973. ^ "Minnesota Twins 12, Detroit Tigers 1". Baseball-Reference.com. August 14, 1973. ^ "Old Tigers Sent Packing as Detroit Cleans House". Vancouver Sun. August 8, 1974. ^ "Detroit Tigers 8, Milwaukee Brewers 5". Baseball-Reference.com. September 20, 1974. ^ "Colbert to Tigers in 8-Player Swap". Bangor Daily News. November 19, 1974. ^ "Oakland A's 4, Detroit Tigers 0". Baseball-Reference.com. June 8, 1975. ^ "Rodriguez Out for Year". Ludington Daily News. August 27, 1976. ^ Ralph Bernstein (December 9, 1977). "Blue Limbo, a Bizarre End to Winter Meetings". Gettysburg Times. ^ "Cleveland Indians 2, Boston Red Sox 1". Baseball-Reference.com. September 13, 1978. ^ "Kuiper Awaits Word, Indians' Injuries Mount". Youngstown Vindicator. June 3, 1980. ^ "Indians' Reserve Sparks Victory". Milwaukee Journal. September 3, 1981. ^ "27 Blue Jays Up, 27 Blue Jays Down". Record-Journal. May 16, 1981. ^ Herschel Nissenson (March 30, 1982). "National League East 'Managing' a New Look". The Free Lance-Star. ^ "Braves Beat Mets; Veryzer Breaks Leg". St. Petersburg Times. June 2, 1982. ^ "Royals Club Cardinals". Ocala Star-Banner. April 3, 1983. ^ "1984 National League Championship Series, Game Four". Baseball-Reference.com. October 6, 1984. ^ "New Players Come; Former Stars Fade". Lewiston Journal. April 8, 1985. ^ Paul, Tony (July 9, 2014). "Former Tigers shortstop Tom Veryzer dies at 61". Detroit News. Archived from the original on 2014-07-14. Retrieved July 9, 2014. This page is based on the Wikipedia article Tom Veryzer; it is used under the Creative Commons Attribution-ShareAlike 3.0 Unported License (CC-BY-SA). You may redistribute it, verbatim or modified, providing that you comply with the terms of the CC-BY-SA.